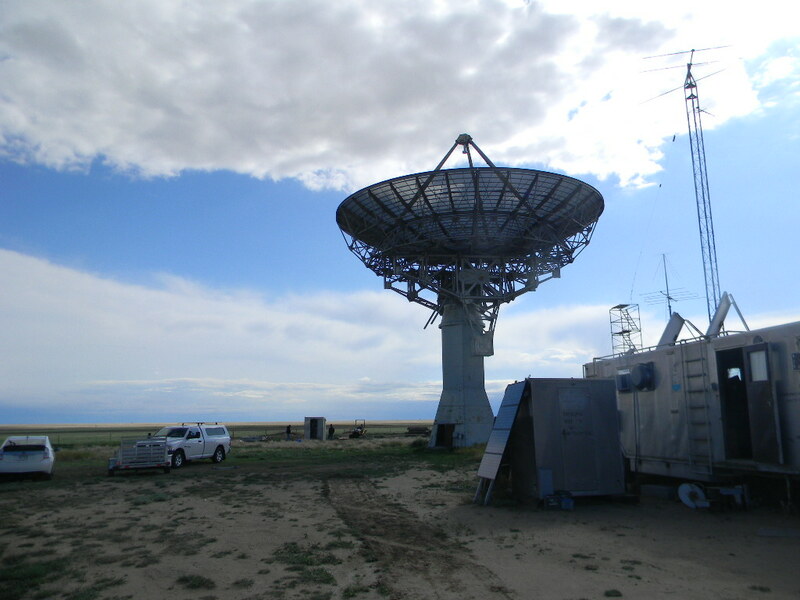 We worked at the antenna site in Haswell from Friday May 18 through Sunday May 20, 2018. We essentially worked in two teams. The first team was at the site from Friday afternoon through Sunday morning, with some in that team just coming on Saturday. The second team worked Sunday afternoon. 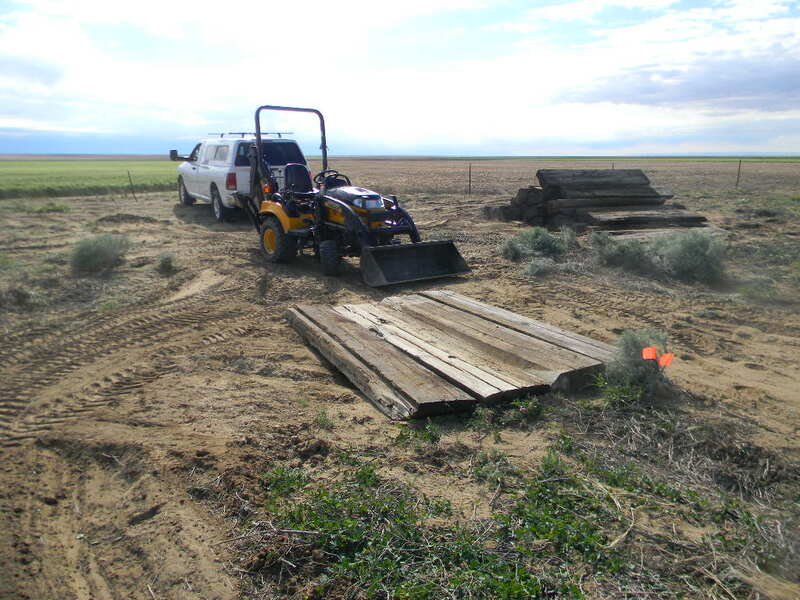 Beginning of work on a new toilet facility “outhouse” in the southwest corner of the site. Aaron Reid brought his tractor. He excavated a large 5 1/2 foot hole, which will eventually be used to properly dispose the effluent from the outhouse. He also completed covering of the 600-foot trench that had been dug earlier to install the power line in the site. And he also excavated a new trench from the pedestal to the Comm. Trailer, to be used to lay control lines for our antenna pointing systems. Initial checkout of the 5-band trap vertical antenna for ham radio at the bunker. Removal of a 10-foot satellite dish antenna in Sugar City. 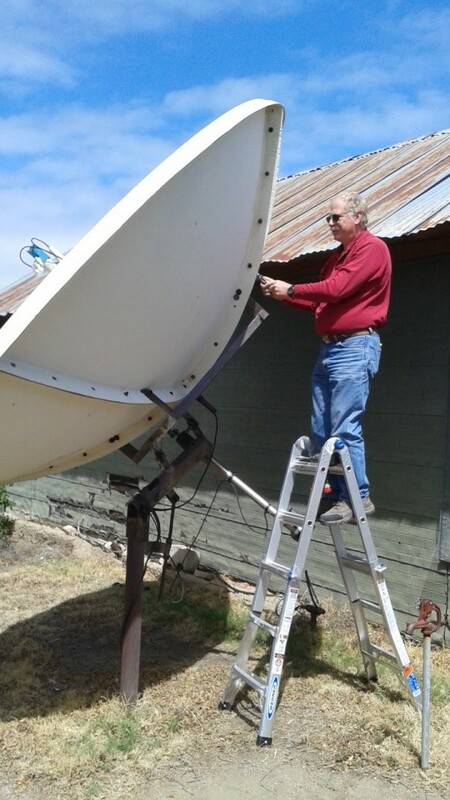 Continuing work on the dish antenna pointing control systems. Contributors to this post are Steve Plock, Bill Miller, and Dave Molter, with additional writing and editing by Gary Agranat. Photos by Bill Miller, Gary Agranat, and Steve Plock. Working on this trip also were Aaron Reid, Paul Berge, and Floyd Glick. Thanks to everyone who helped on this trip. I arrived Friday afternoon. Paul Berge arrived shortly after and Aaron Reid not long after that. We ate a little dinner and turned in. Right around sundown it started raining. It rained most of the night and stopped around sunrise. Because it had rained all night it was pretty muddy outside. We helped Aaron unload his tractor off of his trailer. We then started cleaning debris out of the 600′ trench ahead of the tractor that was pushing the low side hill made by the ditch witch down into the trench. We then placed the barrier tape into the trench ahead of the tractor which pushed the high side berm into the trench as well. We tromped through a lot of mud that morning. Next we cleaned out the building that would become the new outhouse. Then Steve and Paul ran an 85′ coax cable from the new vertical into the bunker. 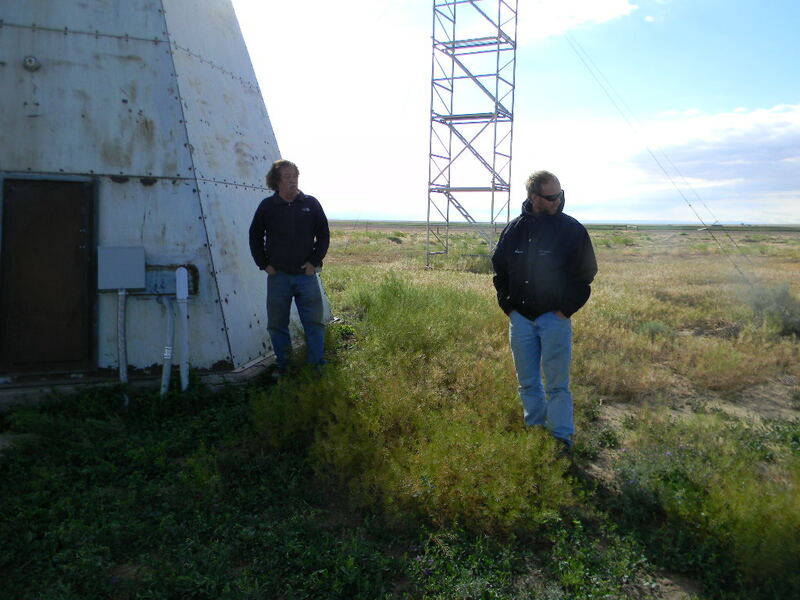 When Gary arrived he checked the antenna out using Ray’s Intellituner as a crude analyzer. It checked out OK on 80-40-20-15 and 10 meter phone portions of these bands. Floyd Glick showed up and started helping out to get the outhouse up on the old platform that had the battery box building on it. We used a couple of chains and the tractor and some boards to accomplish this. Next I marked the spot the Ed had wished the pit to be placed and Aaron dug it to a depth of about 5 ½’. All three of us worked together to cover the pit with railroad ties. Next I marked the 2nd trench, from the pedestal to the Comm. trailer, after consulting with Paul to stay clear of the existing conduit. By that time everyone was pretty tired and turned in for another, night. Sunday morning everyone left before noon. I led Aaron north on County Road 20 until we hit CO Highway 96 up in Haswell. Told him to pick up Highway 287 north in Eads. Site of our new toilet facility “outhouse”. We are repurposing a railroad shed. Aaron Reid excavated a 5 1/2 foot deep hole with his tractor behind the shed, where the effluent will properly be disposed. We plan to have the “outhouse’ in service by the time of our annual Open House in August. Our plans include installing electric light and heat. The 5 1/2 foot deep hole excavated by Aaron Reid with his tractor. Old railroad ties were placed over the hole afterwards for safety. We are cleaning out this former railroad shed for use as our new outhouse on the site. It had railroad electrical components and some debris accumulated over time. In the photo is Floyd Glick helping with the cleanup. Steve Plock and Aaron Reid inspected the route for excavating a second trench, for the dish antenna pointing system Syncro wiring. 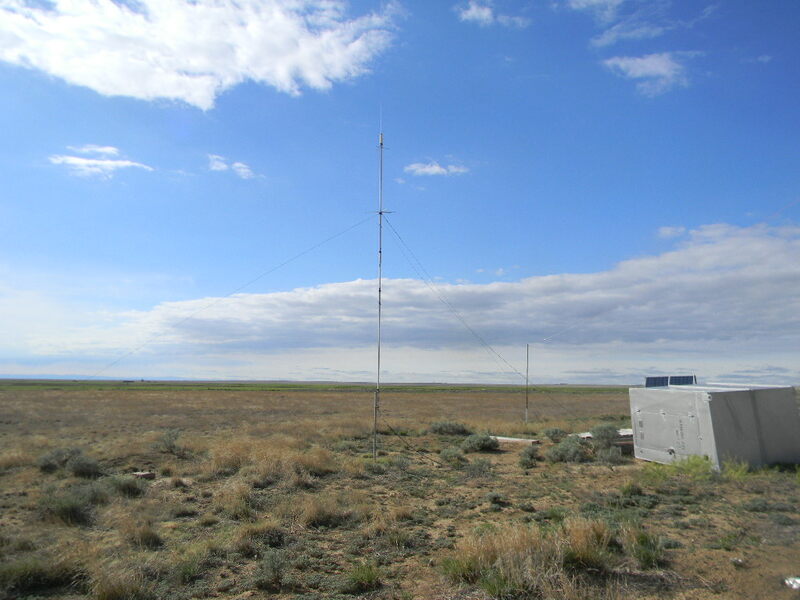 On our last trip we installed a donated 5-band trap vertical antenna for our ham radio station at the bunker. Although we had radial wires with the donation, we didn’t yet have time to install those. 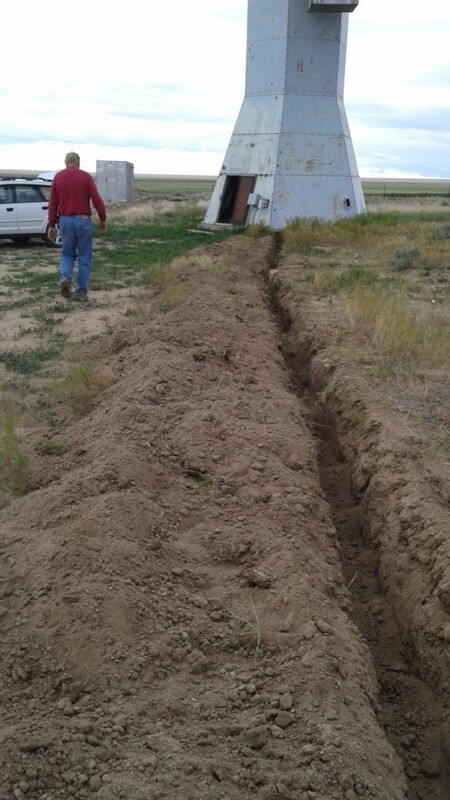 Before I arrived on this trip, Steve Plock installed an 85 foot coax cable from the antenna base, through the doghouse, to the ham station in the bunker. Although he didn’t try to make any contacts, he reported good signal reception using the IC 706 on 40 and 20 meters, including DX from Europe. The IC 706 has an attached automatic antenna tuner, and he reported there was good tuning on all of the bands. I decided to hold off installing the antenna radial wires, and instead check how well we could operate in the current set-up. I systematically checked the SWR and the ability to tune on all 5 wavelength bands of the vertical (80, 40, 20, 15, and 10 meters). I confirmed we could tune well enough on all of the band spectrum except for the 20 meter Morse Code segment. I tried making some phone contacts but succeeded only with one. 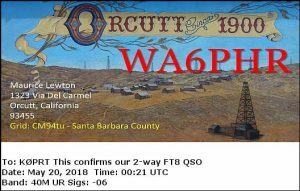 And for the IC 706 I didn’t have the right connector for my CW key. I therefore instead set up a Yaesu FT-950 with a SignaLink digital interface matched for it. With that I succeeded in making 30 FT-8 digital contacts, most on 40 and a few on 20 meters. 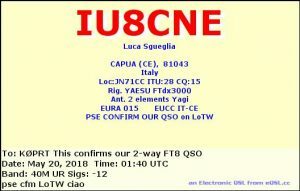 I was able to do some DX (distance contacts) on 40 meters: IU8CNE (Italy) and LU5VV (Argentina). Plus we made one New Zealand contact, with ZL2IFB, on 15 meters, but otherwise DX conditions were poor. The other contacts were across the U.S. and to northeast Canada. 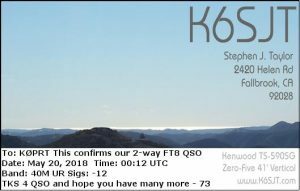 I also had one traditional Morse Code CW chat on 40 meters with K3WAS in Kansas. And so the vertical antenna without the radials does work, and we do get out at least domestically. The somewhat poor FT-8 DX suggests radials may be worth installing still, although I cannot rule out that we had poor band conditions. 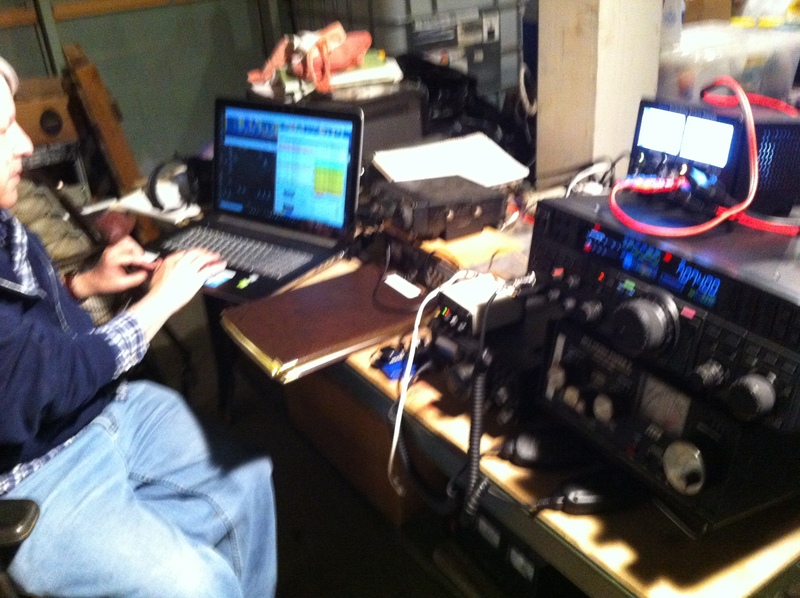 Gary Agranat WA2JQZ operating FT-8 at the K0PRT station in the bunker. Photo by Steve Plock from his smartphone. The vertical antenna set up by the bunker, with coax feed from the doghouse. A benefit of using a digital mode like FT-8 is you can see feedback of where you are received, on the PSK Reporter website. 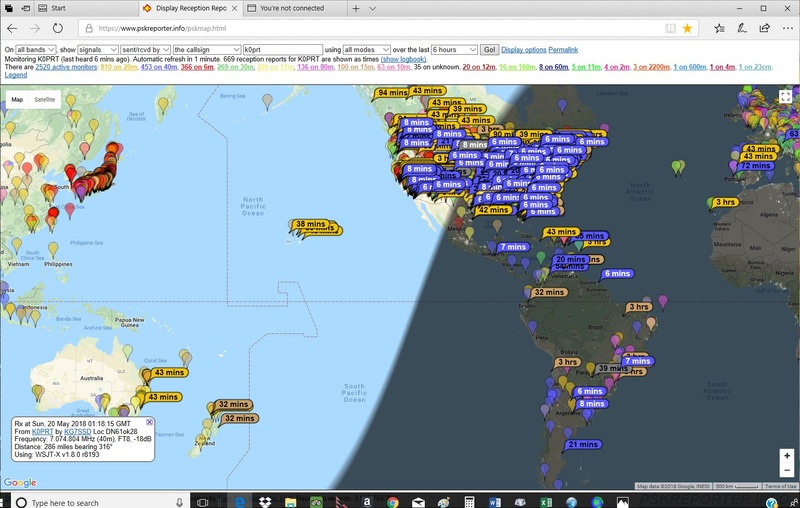 This screenshot displays reports by other hams of where we were received for the previous 3 hours, at about 7:25 pm local time on Saturday (0125 GMT). The blues are for the 40 meter band, the yellow for 20, and the brown for 15 meters. On Sunday I met Bill Miller in Sugar City, and tore down a 10 foot dish that was donated to DSES. The dish was left at the residence until a trailer can be provided to remove the parts. The base post was not removed from the concrete and will need to be done on a future trip. This effort also led to 3 more fiberglass 10 foot antennas identified which will be donated and obtained at a future date. 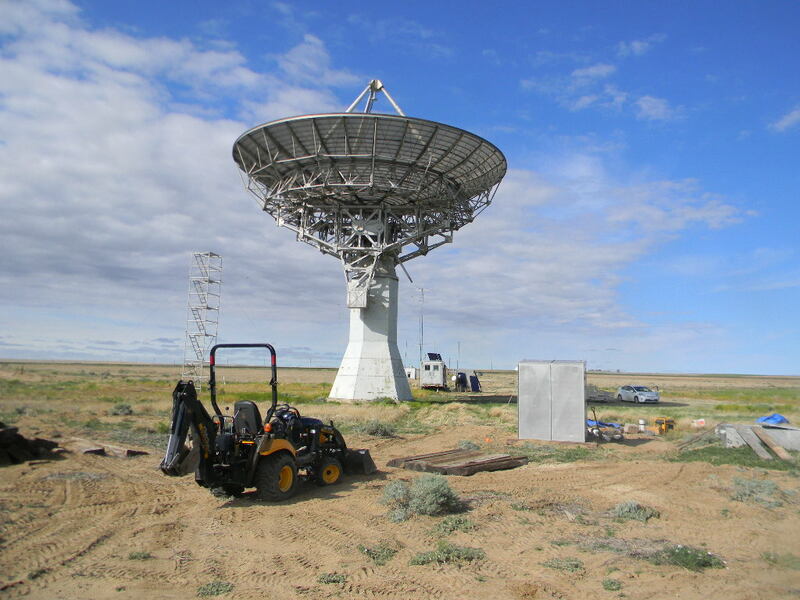 When we got to the site we energized the dish drives and observed noise on the elevation encoder lines shown by the LEDs flickering and watching the position signal on an Oscilloscope. Ferrite beads were installed around the elevation encoder lines. There was no change to the amount of noise present on the wires. The elevation readout cover was removed and the cable was removed from the encoder. The connector was opened to allow inspection of the wiring. The cable shield drain wire was temporarily jumpered to the frame ground. The signal noise was reduced. The cable drain wire was connected to pin S of the encoder (Frame Ground). 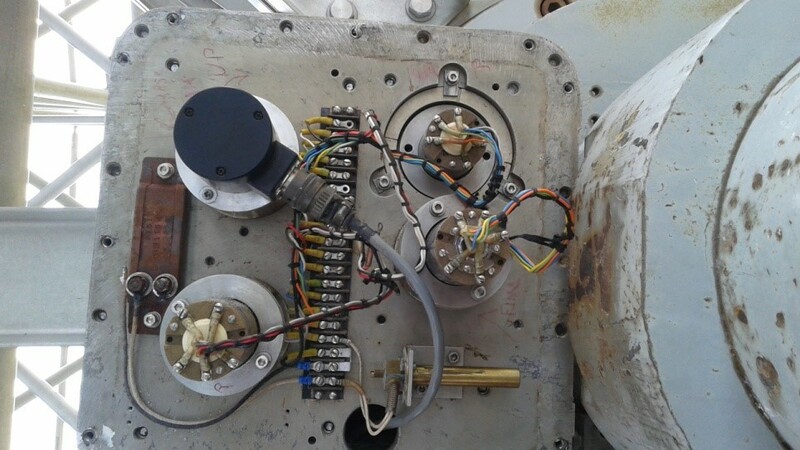 A jumper wire was also attached to the drain wire and connected to the encoder body. The mount was run in elevation and azimuth and the readout was stable, the LED did not flicker. The dish control was transferred to the trailer. The control panel was used to move the mount in azimuth and elevation. The readout computer was energized and the remainder of the day was spent looking for the paper that contained the logon to the portable computer. It was observed that the electrical trench was backfilled. The trench between the tower and trailer was dug out. The ramp has a good sized amount of tumble weeds in residence. I arrived at Sugar City at 9 AM and met with Dave about 10:30. 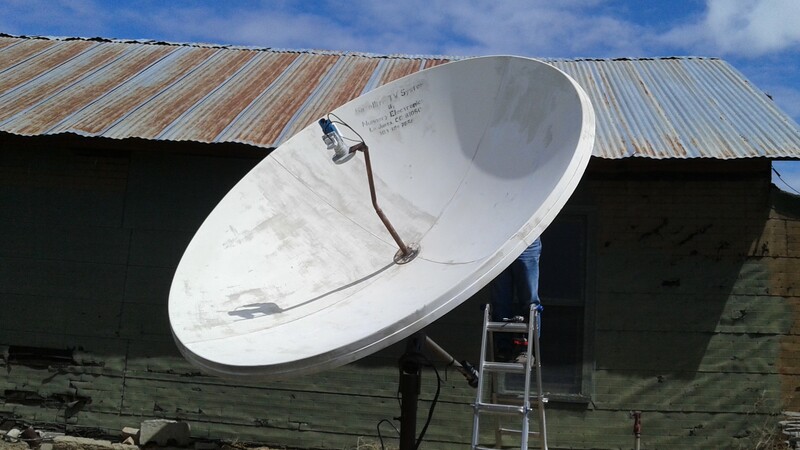 We went to Sugar City contact’s (Sue) house and proceeded to disassemble the 10ft Fiber glass satellite antenna and mount in the back yard. This took about 3 1/2 hours and we didn’t complete digging up the concrete foundation but got a good start on it. This will be completed and the dish will be transported in a future trip. 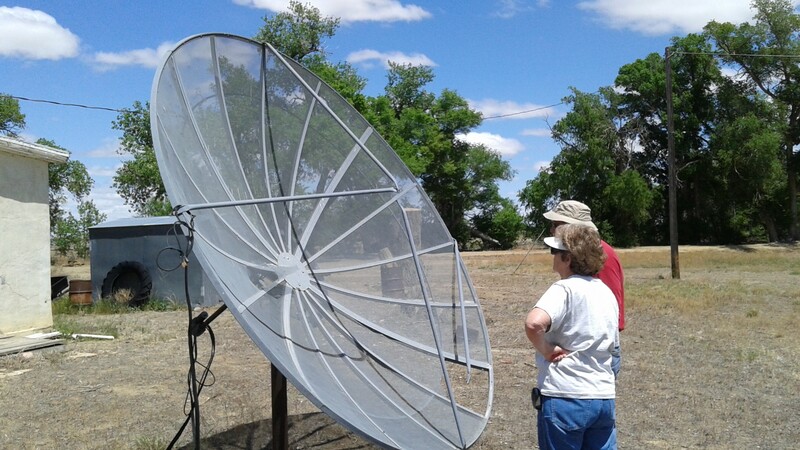 Sue gave us contacts for a 10 ft mesh dish in Sugar City and for her daughter’s perforated dish in Rocky Ford. Dave made contacts for 2 more fiberglass dishes in Sugar City. Seems we can have all of these that we want for the asking and labor. We didn’t get to the Plishner site until about 3:00 on Sunday and by then the previous crew of Aaron Reid, Steve Plock, Gary Agranat, Paul Berge and others had left the facility. Dave and I set up to determine the cause and fix for the elevation encoder noise that we have been fighting for the last five months. We took a methodical trouble shooting approach with scope and meter instrumentation. We verified that the elevation encoder circuit was much more susceptible to the motor controller noise than the azimuth encoder circuit. It was even susceptible to the Azimuth motor drive but to a lesser degree than to the elevation drive. After trying several things we discovered by continuity checking that the Azimuth encoder wiring shield was grounded to the telescope structure at the encoder end but the elevation encoder wiring shield was open. We opened the elevation encoder box in the upper deck and attached the shield drain wire to the chassis ground with a clip lead. This had a dramatic effect on the noise as seen by the scope and the 12 bit LEDs indicating the input signal state on system 1. Seeing this, we permanently attached the shield drain wire to Pin “S” (Case GND) of the encoder connector and to the attachment screw on the encoder with a flying lead. This substantially reduced the motor drive noise problem on the elevation encoder circuit and should provide much cleaner encoder signals to both system 1 and 2. Of note: There is still a lot of HF noise on the system 1 electronics as indicated on the scope. It appears to be from the small switch mode power supply in the box and the motor drives. It may be wise to change out the small PS with one that is less noisy. We were unable to check the Laptop program operation with System 1 due to a missing password. We saw the trench that Aaron Reid had dug for the syncro cabling. Thanks to Aaron for that. I brought down a 350 foot spool of 15 conductor x 18awg wire for the syncro connection. Unfortunately we had no suitable conduit to install in the trench so we will have to do that on a separate trip. I left the spool of wire in the locked pedestal for when it can be installed. The deal with OEM Electronics is to use what we need and return the rest for credit as soon as possible. The approximately 160 ft of wire needed will be charged to Michael Lowe’s OEM credit that he established several years ago. Two curious boys from Los Animus HS stopped by while we were working in the pedestal and we told them about the Dish, but not knowing them didn’t offer a tour. Bill took their names and Email addresses for future contact. Several spools of RG59u and a 4KW generator were left in the open after the clean out of the RR shed to be used for the outhouse. We moved the wire to the locked pedestal and Dave took the generator back to Springs to see if he could get it running. We put food in the bunker away, locked up the site and left about 7:30PM. Exposed Elevation Encoder and Syncro’s in the upper deck of the pedestal (Level 4).